Gosh, after the MORNING I’ve had, I hardly know where to begin…. (read blog previous) This is your warning: THERE WILL BE RABBIT TRAILS….just follow me….it’ll work itself out, I PROMISE! Just start the video and keep reading….just keep reading…. But this afternoon, my sweet friend Hannah calls me to tell me one of our friends is being BAPTIZED this evening! WOOHOOO and THANK THE LORD! I MUST be there to take photos! RABBIT TRAIL #1: close to the church is an old bar that I LOVE to take pictures at because the graffiti IS FLIPPIN’ AMAZING! I’m aware that sounds odd…I’m OK with that. I get all excited when I see NEW graffiti! So I’m headed to the church and pass the bar and there is NEW GRAFFITI PLUS the artists are THERE doing it! I fought the urge to slam on my brakes and skid into the parking lot. I calmly pass, and then flip around as fast as I could and then come skidding into the parking lot. 😉 I have only a certain amount of restraint here. All graffiti artists STOP and regroup together forming a pretty formidable stance of puffed up chests and bared shoulders. I have this split second of “Do I get out or floor it?” They are scary looking. I have nothing but KIDS in the car with me who will wet themselves and run away if something bad happens….Get out or run away? Of course I got out…are you kidding me?? I get out and start immediately with my introduction: “OMG I can’t believe I finally get to MEET you guys!” (that might help my death be alittle slower at least….) “I am a photographer that LOVES your art!” (they don’t need to know I’m not professional yet…..they are not retrieving weapons from behind their backs, this may be alright….) They were obviously very confused with this insane woman practically hugging them and thanking them for putting graffiti on this old bar, BUT the WORDS came out of my mouth! Very few times in my life has this happened and I ACTED on it! I started with….”I go to the church right down the street, and there are quite a few people who enjoy your art as well…..” and the invite to come and visit us was out there. Can’t take it back now. Either I die and listened to God, or perhaps some people get saved and I don’t get mangled tonight. And I do want to say, the DO have permission to tag the building. OK, back to the baptism…so I get to church SO excited to possibly take some pictures. Ask permission of our friend to take the photos and after I get the words out, and he grants permission, a pretty little mexican lady I do not know tugs on my arm and asks to speak to me in private. 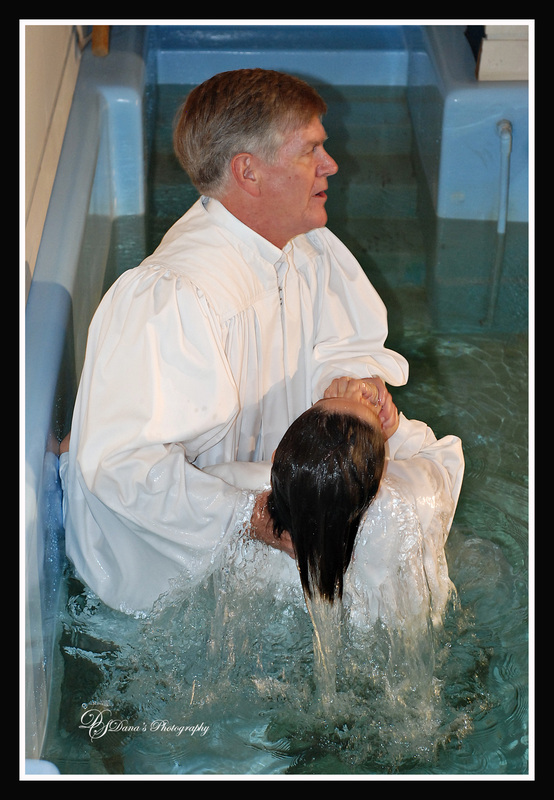 Being the big, loud lady, I actually thought she was going to say I’m too loud….but instead, she very sweetly asks me if I would please take her baptism picture as well. She’s alone there and did not have her camera. OK, yes, stop and cry a minute…you know I did…..
RABBIT TRAIL #2: When I got this beloved Nikon D80, I did in fact dedicate it to the Lord. I very specifically said I want to use it in service in whatever way He wanted me to. I had no idea HOW I would do that when I made those words because it was a matter of reading the manual 3 times before I figured out how to turn it on…..now a little over a year later, and here I am….doing things I never imagined I’d be able to do….in service to the Lord. No, I haven’t stopped crying either….it’s alright, the words get alittle blurry, but we move on anyway…. So I go up to the Baptism room where a little old woman is coming as well. I am not being disrespectful at all, please do not misunderstand, but when I say little old lady I mean just that….Her and her husband belonged to a church for 52 years when he realized he had not been Biblically baptised and he wanted to do that! And so did his wife. OMG….you could not BELIEVE how beautiful of a sight THAT was! 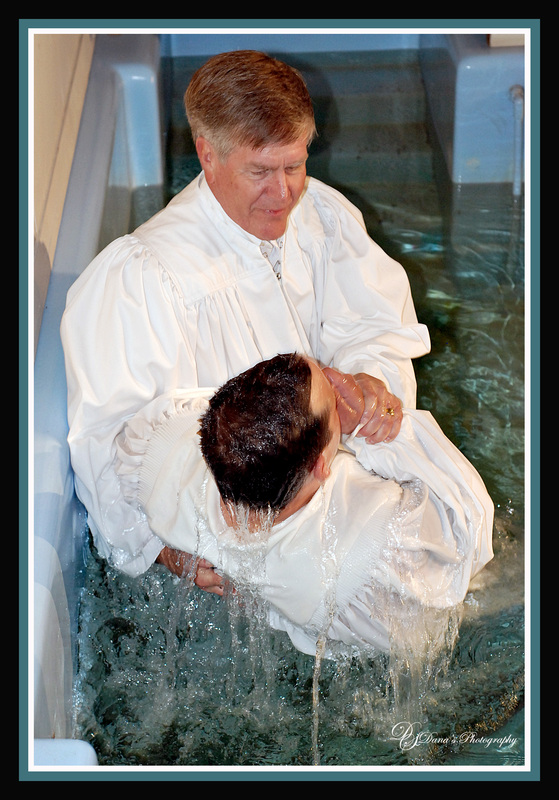 Anyway, my friend was first to be baptised: BEAUTIFUL picture! Followed by the sweet mexican lady that didn’t speak English very well, but with a faith as big as her smile! Then the older couple. The pictures are SERIOUSLY breathtaking! The little old lady has a really difficult time getting into the water (and here is a very small rabbit trail: the SWEET lady that was helping her into the water, in this BEAUTIFULLY expensive, perfectly tailored outfit, finds out that she is NOT going to be able to get her all the down the stairs. Without even thinking, she just steps INTO the water WITH her! Gorgeous, perfectly tailored, wonderful lady knows that this baptism is far greater than any clothes or nice shoes and she just GOES in right along with her. Diane, wow…..that’s all my heart can say…..). I take the photos that make me cry, and know they are going to HAVE to have help getting her back up. I set my camera in a place out of the way, and start the helping process of getting her out of the water. She’s UP and OUT and I suddenly hear the worst sound EVER and my stomach just simply falls. I know what it was. My camera, so safely put out of harms way, or so I thought, was accidently knocked into the floor. A fall of about 7 feet. I won’t cry. I won’t cry right now. I’ll help the lady into the bathroom to change, and I won’t cry. I WON’T! When I can, I pick up the camera and have that horrid knotting in my stomach. I know just at first glance something’s not right. I click it on and it powers up, but won’t take a picture. I won’t cry….it was an accident, she didn’t mean to knock it off, it was an accident, don’t cry….if it’s broken, I can’t replace it and I am WELL aware of this fact. All hopes of any photography business next year is WAY out the window….Lord, don’t let me cry. Please Lord…Please Lord…PLEASE LORD! I AM BEGGING YOU…. I leave the room as quickly as I can because I know I’m going to lose it. Go back to the service to collect my things….BREATHE….BREATHE…..check your camera…. RABBIT TRAIL #3: I worked for 6 months, doing odd jobs and saving as much money as I POSSIBLY could to get a little over HALF of the money for this camera. 6 months If it were not for the blessing of a wonderful family member, it would have been another 6 months before I had enough money. I only have 2 lenses for the camera: 50mm 1.8 and a 55-200mm zoom lens. That’s it. All the lenses I could afford, and one of them I haven’t completely paid off yet. The zoom lens is $400 and the 50mm lens is about $110. I USE the 50mm MUCH more often then the zoom. That’s my PRIMARY lens, but it’s the cheaper of the 2. Right before I went back there, I was going to change to the zoom lens, but decided against it. I take the camera and my blubbering self out to the foyer to see if it’s my CAMERA or the LENS. Lord, please, PLEASE let it be the lens. PLEASE let it be JUST the lens….just the lens. Please PLEASE Lord….. Take a photo, nothing. My heart stops and my stomach drops to the floor. Change lenses. Take a photo, no auto focus. Again, my heart stops and my breathing has become labored. Check the auto-focus on the side of the camera, switch was on MANUAL! YES there’s HOPE! Switch to auto and snap another photo! PRAISE THE LORD!!! THE CAMERA WORKS!!!!! The 50mm lens is beyond fixing. But, it’s cheaper to replace. Not until AFTER the holidays though because I still do not have $100 to replace a lens, but I still have my zoom. Not as GOOD, but it works. The first one baptised tonight, was ONE of my names on my list. I have been praying for him and his wife every day for a little over a month now. That just hit me HARD. Here I am crying over a CAMERA that I cannot replace. A LENS that I cannot replace RIGHT NOW, and God is smacking me in the head to get my attention: LOOK! Look at the BIGGER picture!!! YOU, whom I love and have CHOSEN for bigger and BETTER things, was just able to PHOTOGRAPH the baptism of one of the names on your LIST! THAT is what service to ME looks like….pick up your camera and follow ME….I’m taking you HIGHER…..
Dana….TRUST ME….and I will show you things that you will never believe….. The song above is by Need to Breathe and it’s called Washed by the water. That is Chandler’s song. Enjoy it. Listen to it again and again….I am WASHED by the water…. Oh that gives me chills to know that one of the people on your list was baptized today!! How wonderful. Praise God for answered prayer. I’m sorry about the camera lens. Dana, I’m in tears… what an incredible day. What a blessing to be using your camera for God! I love that you were able to take a photo for the woman who didn’t have anyone there for her…what a beautiful day altogether! Cool Dana, what an amazing day! It’s incredible how wondrous His works are and here we are just wandering around trying to figure it all out! Thanks for your rabbit trails…I always enjoy them. What an awesome way to end to a not-so-good morning. AHHH this song is making me cry AGAIN! LOVE IT!!!! thanks so much for your amazing service to the Lord, in many different ways! You, my dear friend are simply AMAZING and the Lord has blessed you with so many talents and you are using ALL OF THEM for God’s Glory! Heavenly Father, thank you so much for my dear friend Dana. She is a very strong in her faith and her day to day life shows that she is truely living for you and I thank you for that Father. I thank you for her beautiful family and her ability to help others in so many different ways! She is one of your servants Lord and she is ready to follow you wherever you take her! Thank you Lord for Dana!!!!! What a beautiful post. I’m glad I took the time to read it. 🙂 I pray that the Lord will provide you with a new lens! but I have one question… why do you keep saying OMG? Isn’t that taking the Lords name in vain?? Why would you say that? I am sorry if these questions offend you… it just hurts my heart every time I hear or read someone say “On My God” when they are not truly in prayer. I thank you for visiting my blog! And I wanted to assure you that when I write “OMG”, for ME, it means oh my gosh. For those who know me in real life, they hear this quite often. I don’t see ‘gosh’ as using the Lord’s name in vain and would never do that.